Welcome to the 2018 – 19 academic year! It is really lovely to welcome back our little ones from last year who have now become our big ones and to see how much everyone has grown over the summer break. We are also very pleased to welcome all the children who are joining us for the first time this term. The staff are really enjoying getting to know their new children and supporting them as they settle in to life at preschool. We are very aware that settling in can be tricky for some children (and parents! ), as can returning after a long break. Our team are very experienced at supporting these transitions: establishing routines and building confidence is a big part of coming to Playgroup. To support this big transition, our first Book of the Moment this term is Martin Waddell’s “Owl Babies” This is a delightful story about 3 little owls who worry that their Mother won’t come home and are overjoyed and reassured when she flies back to them with their dinner. It is a story that the children can relate to as they get used to parents dropping them off and coming back at home time. It is also great starting point for thinking about and enjoying the changing seasons. Cake Sale Our Committee are organising a cake sale to raise funds for new resources for Playgroup on Monday 17th September. The sale will take place at the Playhouse at lunch time and at 3pm. If you are able to bake cakes or biscuits for them to sell, please bring them to the Playhouse on Monday morning. AGM – The Playgroup is managed by a Committee of parent volunteers. If you would like to take part or are interested in finding out more, please speak to our current Chair, Lizzie Harris. Our AGM is on Tuesday October 9th – posters giving full details will be going up soon. CI Photography will be coming in to Playgroup on Wednesday 21st November to take individual portrait photos. If your child doesn’t usually come on a Wednesday morning but would like to be included in the photos, please speak to Jacqui or Fiona. 30 hours free childcare is now available to qualifying families. 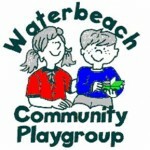 To find out if you qualify for Spring 2019 (and to register if you do), please go to www.childcarechoices.gov.uk If you are interested in booking your child in for 30 hours or would like to use some of your entitlement with us please speak to Jacqui or email info@waterbeachplaygroup.org.uk. Mobile Phones – A quick reminder that the use of mobile phones, cameras or personal electronic devices of any sort is not allowed anywhere on the premises (including the front garden). This is for the safety and privacy of the children. If you are coming in to Playgroup for a meeting during the day, we will ask you to leave your phone at the front desk. Toilets – If parents or carers would like to assist their child to use the toilet in the morning, please use the adult toilet in the reception area as other children may be using the children’s toilets. In order to safeguard all of our children and respect their privacy the only adults allowed in the children’s toilets are staff. Waterproofs and wellies – The children have access to the garden and water play in all weather. At this time of the year, please remember to send your children’s wet weather clothes in in their drawstring bags. These can be stored at Playgroup – or taken home each day. Please keep sending your child with spare clothes as water play is always available too and please check to see if the clothes in your child’s bag still fit them. Please don’t send your child in crocs, flip flopso r other loose fitting shoes as they are not suitable for climbing on the Play structure. Please label all your child’s belongings as this really helps staff. Uniform – Our blue Playgroup t-shirts and sweatshirts are available to purchase (£7 per t-shirt, £11 per sweatshirt) They come in the following generous sizes 1 – 2 (t-shirt only), 3-4 and 5-6. We usually have some in stock, please speak to Jacqui if you are interested. Parent Rota –After half term, once the children have settled in , we welcome parents and carers to come in and help at one of their children’s sessions. We really appreciate the help and it is a nice way to understand your child’s experience at Playgroup and get to know their Key Person. Please look out for our Parent rota on the notice board if you would like to join us for a session. Parents can also join us at their child’s Forest School session, please speak to Jacqui or Fiona if you are interested. Extra Sessions – We are happy to take one-off bookings for sessions where we have spaces. We charge for extra sessions at the same rates as our normal sessions and ask for payment in full when booking. Sessions must be booked with Jacqui so that she can check that space is available and payment must be made in advance. Please see Jacqui for full details. Facebook– Join our Facebook group for more updates and pictures of our activities! We are a nut free building. Please do not include any nut products in your child’s lunch. We regret that we cannot dispose of nappies on site. Please make sure that you collect nappies from the bin by the front door. If your child is ill and cannot come to Playgroup, please call and let us know. If they have experienced vomiting and/or diarrhoea, they are not allowed to return to Playgroup for 48 hours after the last incident. Please label all your children’s belongings. Staff spend a lot of time trying to find children’s coats, gloves, jumpers etc. and we do occasionally have items of clothing getting lost or going home with the wrong family. © 2011. Registered charity number: 1009956. Ofsted URN: 221774.